Thank you for your interest in supporting a mission volunteer or team! Click the button below to find their fundraising page. Each year, over 90 mission teams serve overseas with Mustard Seed Communities on short-term mission trips. Mission volunteers are responsible for raising funds to support their own travel, the mission volunteer program, and the MSC home at which they are serving. Our mission program serves as an inclusive spiritual environment for volunteers to grow their faith. 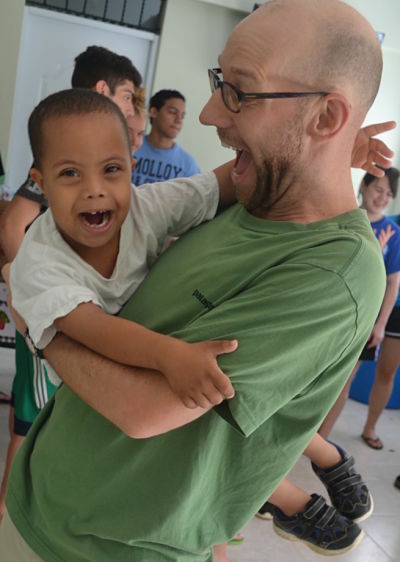 While it may be challenging for many to reach out to residents with disabilities who have been forgotten and abandoned by society, we have found that once our mission volunteers bravely step outside of their comfort zone, they learn so much about themselves, their team, and the world around them. A mission trip to Mustard Seed Communities is a unique experience. Your donation to support a team or volunteer will change many lives - those of the volunteers you are supporting, and those of the residents who get to experience a bit more of the world with every interaction. Thank you for helping to make those interactions possible as a mission trip donor. Read Allison's full reflection from Sophie's Place and many other mission moments here. Mustard Seed offers mission trips to Kingston, Jamaica; Moneague, Jamaica; Montego Bay, Jamaica; Nicaragua; and Dominican Republic. Visit our About MSC Missions page for more details.